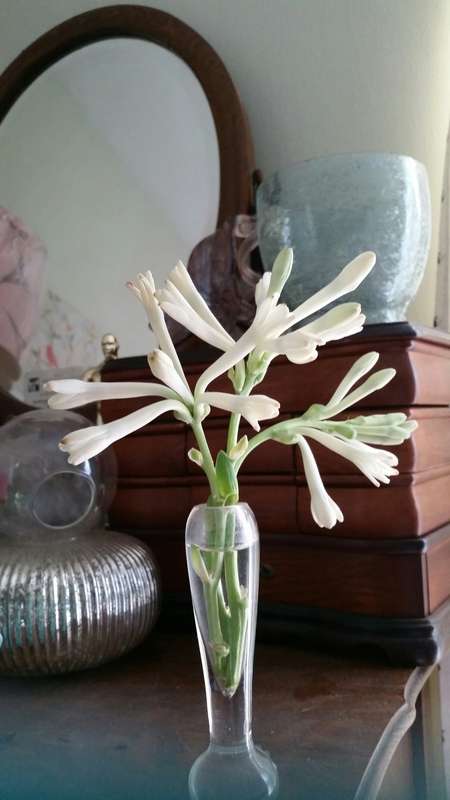 When I think of intoxicating fragrances, the first thing that comes to my mind is the Tuberose. In the warm air of late summer, the scent of Polianthes tuberosa can literally capture your mind and your heart as it permeates the air. Polianthes Tuberose is one of the earliest cultivated plants. 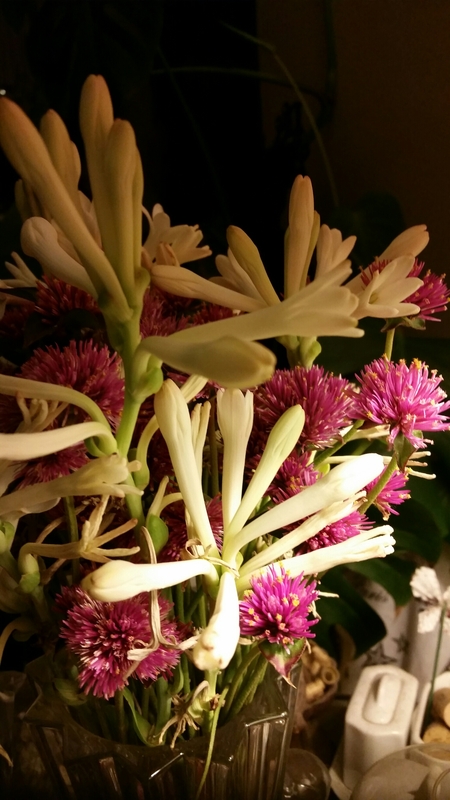 The Aztecs originally grew Tuberose. When the Spanish and French discovered it and took it to Europe where it also gained much popularity, particularly for weddings and large gatherings. 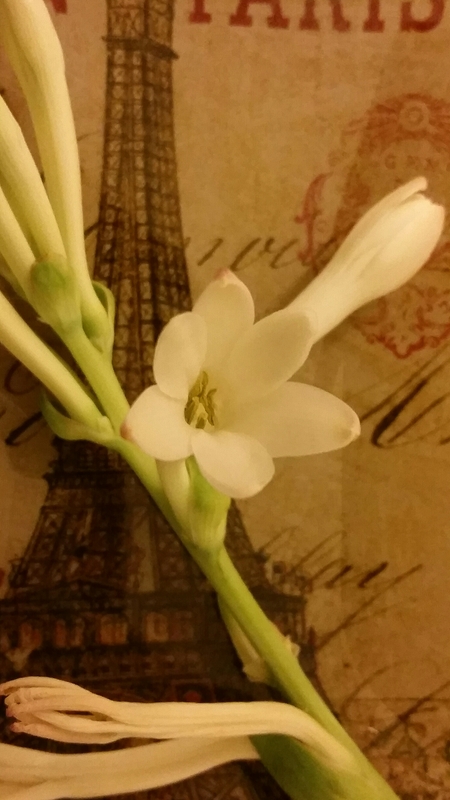 The Tuberose was quite popular in the Moon gardens of Europe where the warm air of the evening captured the intoxicating scent. Today, it is mostly grown in the South Western United States and the Gulf Coast of Florida, however, it can also be grown where there are at least 4 months of warmer weather. Great in pots and in the ground (zones 8 and higher). In the cooler zones, one can grow Tuberose and then lift them before winter, as they need to be kept above 20 degrees to avoid damaging the rhizome. This rhizome forms a grass like clump where 3-4 foot stalks rise with a wonderfully fragrant bloom that most people either love or find just a tad too overpowering (I personally LOVE the scent!) Planted 2 – 4 inches deep and 6 to 8 inches apart, Tuberose needs to be planted in moist but well draining soil. If the soil holds too much water, the rhizome will rot. The hotter, the better as afternoon sun is one thing that will make your Tuberose bloom to perfection. It will not hurt the plant if you cut the blooms for arrangements. In fact if the season is long enough, the more you cut, more stalks will rise and provide more and more spikes with potential blooms. If you must dig these rhizomes in the fall, allowing them to air dry for about 8 – 10 days and then keep them at 50 degrees until the next season for planting. You can then start them indoors to have a growing advantage for the next season. Two of the better known cultivars are Mexican Single and Pearl, which has a double bloom – phenomenal!!! Whether it is the single or the double bloom, Polianthes tuberosa – YOU CAN GROW THAT! !